There are many known benefits of a diverse workforce, but practice often falls short of understanding. This article looks at data on actuarial students at Macquarie University and the Australian National University (ANU) as well as international analysis, to see how we can attract women to and keep them in the actuarial profession. The benefits of a diverse workforce are numerous, and encompass both the ideological and the pragmatic. According to Professor Scott Page, organisations with diverse teams make better decisions and have better outcomes, to the extent that when “solving a problem, cognitive diversity can trump ability” . A McKinsey study reveals that companies with high numbers of women on their boards significantly and consistently outperform those with no female representation. However, practice often falls short of understanding. A recent study found that nearly two thirds of the UK’s top 1,000 accounting and finance firms have no women listed as executive board members, partners or senior accountants. And despite efforts in the actuarial profession, only 30% of members of the US actuarial profession, 23% of UK actuaries and 33% of Australian actuaries are female. One part of building gender diversity in the actuarial profession is attracting women to the profession in the first place, and the other is encouraging them to stay. An analysis conducted by the UK Institute and Faculty of Actuaries (IFoA) Diversity Advisory Group shows that roughly equal numbers of women and men enter the UK actuarial profession. However, the profession is losing female talent, with non-retiring female actuaries leaving the profession on average 13 years earlier than their male peers, and fewer than 10% of female actuaries believing that it is easy for females to rise up the ranks. This article looks at the first aspect of building a gender diverse profession – attracting women to the profession – and specifically at the Australian actuarial profession, based on data relating to actuarial students at Macquarie University and the Australian National University (ANU). In contrast to the UK, in these Australian programs the proportion of females among students entering university has been – and remains – less than 50% (see Figure 1). The proportion of females is lowest among domestic undergraduate students. 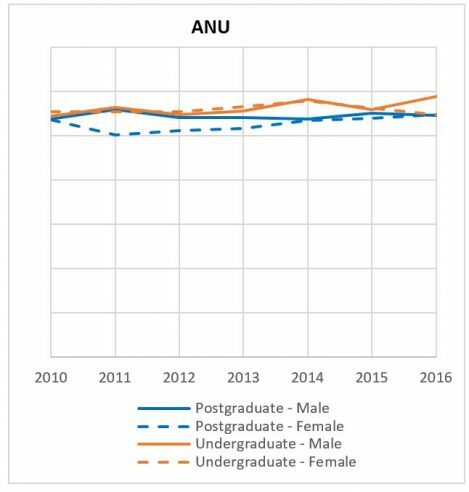 At ANU, between around 30% and 40% of domestic undergraduates are generally females and at Macquarie, between 22% and 32%, with no discernible trends over time. International undergraduates and postgraduates (who are predominantly international) have a higher proportion of females at both institutions, generally ranging between 40% and 55% at ANU and 35% and 50% at Macquarie. Although statistics are variable, the ratio tends to be highest in the most recent years, suggestive of an improvement in gender diversity in this group. The proportion of females among domestic undergraduate students is roughly in line with what we might expect based on numbers of final year school students who take advanced mathematics. 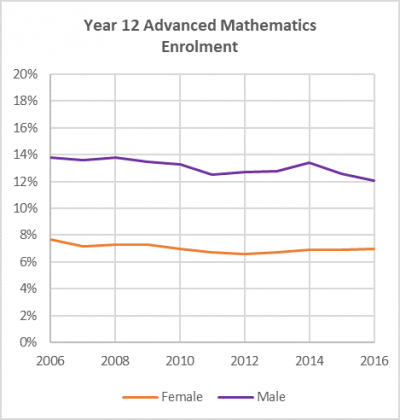 According to the Australian Mathematical Sciences Institute, the proportion of year 12 female students undertaking advanced mathematics has remained fairly stable over the last ten years at around 7%, while the comparable figure for males has hovered at around 13% or 14%. In broad terms, we might therefore expect roughly double the number of males as females, consistent with the female proportion of around one-third that we are observing. A female proportion of around one-third also sits at about the average for all STEM (Science, Technology, Engineering and Mathematics) fields combined, as shown in Table 2. Engineering and Information Technology are much lower than this at only 15% and 16% respectively. 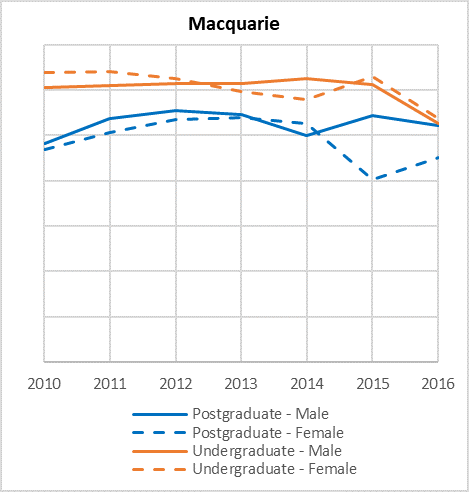 It’s worth noting that in the once male-dominated Australian medical profession, the number of female medical graduates has exceeded that of males for almost two decades, due at least in part to a number of equal opportunity policies introduced in the health sector. Women do, however, remain grossly under-represented in medical leadership roles. It remains to be seen whether the recent government commitment of $4.5 million in the 2018 budget for programs to increase women in STEM will have a similar impact in STEM fields. There’s no clear evidence of any significant difference in performance once in the actuarial studies degree, at either Macquarie University or ANU. Male and female students in their final year of the program have similar GPAs among both undergraduate and postgraduate students (Figure 3). A study of male versus female performance in exams of the IFoA examinations also found no statistically significant difference6. In summary, actuarial studies programs at Australian universities are attracting more females than other mathematical degrees such as Engineering and IT, but have a way to go before reaching gender parity. Experience in the UK actuarial profession and the Australian medical profession show that gender parity is achievable, and something we should aim for. The Lucy Mentoring program pairs female university students with industry mentors to build networks and professional skills. Actuaries interested in volunteering as mentors for Macquarie University students can contact Leonie Tickle at Macquarie University and also find out more here. The Institute’s High School Program aims to raise awareness of the profession and encourage students with a passion for maths to become an Actuary. Request a visit for your high schoolby contacting Jennifer Yu. Actuaries interested in volunteering to visit schools should also get in touch with Jennifer via email or phone (02) 9239 6100. Page, S. E. (2008). The Difference: How the Power of Diversity Creates Better Groups, Firms, Schools and Societies. Princeton University Press, Princeton, New Jersey. McKinsey & Company (2010). Women Matter: Women at the top of corporations: Making it happen, McKinsey. (See also https://www.mckinsey.com/business-functions/organization/our-insights/women-at-the-top-of-corporations-making-it-happen). Bismark, M., Morris, J., Thomas, L., et. al. (2015). Reasons and remedies for under-representation of women in medical leadership roles: a qualitative study from Australia, BMJ Open 2015;5:e009384. Leonie Tickle is Professor of Actuarial Studies and interim Associate Dean (Learning and Teaching) of the Faculty of Business and Economics at Macquarie University. Adam is a Senior Lecturer in Actuarial Studies and Statistics at Australian National University and has been teaching actuarial studies for over 10 years. He has had his research published in a number of top-ranked actuarial journals, in addition to winning the ANU College of Business & Economics Award for Teaching Excellence in 2013. He writes a blog on actuarial education (www.adambuttactuary.wordpress.com) and can be found on LinkedIn and Twitter (/adambuttactuary).